Barnstable is comprised of several different villages including Centerville, Osterville, Marstons Mills, Hyannis, Cotuit and Barnstable (proper). There is something unique about each part of Barnstable and that extends to the various beaches in the area. Here are all the wonderful saltwater beaches that Barnstable has to offer. Craigville Beach, Centerville. This immensely popular beach is located on Craigville Beach Road and features lovely soft sand that is great for laying down a towel and sunbathing, playing Frisbee or volleyball, or building a sand castle. The water is very pleasant and is perfect for a day of swimming. The beach is handicap-accessible. There are bathrooms and showers, and lifeguards are on duty during the summer. To park, visitors need a beach sticker, or you can pay the daily parking fee of $15 for weekdays and $20 for weekends and holidays. Long Beach, Centerville. Located off of Long Beach Road in Centerville, this beach has plenty of space, lots of shells for beachcombers to collect, and magnificent views. The boardwalk at the beach splits off to three different beach areas, so it’s the “choose your own adventure” book of beaches. There are no restrooms available here and there are no lifeguards on duty. You need a sticker to park here, or you can pay the daily fee ($15/weekdays, $20/weekends and holidays). Dowses Beach, Osterville. Located at 348 East Bay Road in Osterville, Dowses Beach is a pleasant beach that is great to enjoy with the family. There is a dock at the end of the parking lot and there are rock jetties, making this a nice spot to fish. There are lifeguards on duty in the summer, as well as restrooms and showers. A sticker is needed to park here, or visitors can pay a daily fee ($15/weekday, $20/weekends and holidays). Eugenia Fortes (East Beach), Hyannis Port. Re-named after civil rights activist Eugenia Fortes (who was asked to leave the beach – which was segregated at the time – in 1945 and refused), this small beach is nestled in a residential community and offers a less hectic and more quiet beach. This beach has lots of shells for beachcombers to find, as well as a small dock. There are many boats in the water and it can be fun to watch them while relaxing on the beach. There are no lifeguards or other amenities and the parking area is small, so it can be hard to get a spot. A sticker is needed to park. The beach is located off of Iyannough Avenue in Hyannisport. Kalmus Beach, Hyannis. 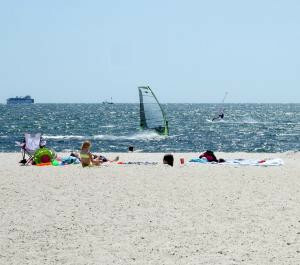 Located at 670 Ocean Street in Hyannis, Kalmus Beach has two sections, one for swimming and the other for windsurfing. This popular beach has restrooms, showers, and a snack bar. The water is warm and pleasant and there are lots of shells to find on the beach. There are lifeguards on duty in the summer. A sticker is needed to park here, or you can pay the daily fee ($15/weekdays, $20/weekends and holidays). Sea Street (Keyes) Beach, Hyannis. Located at 175 Ocean Avenue in Hyannis, Sea Street Beach is a great beach, with soft sand and gentle waves. There are lifeguards on duty in the summer and there are restrooms and showers, as well as a snack bar that serves up all sorts of food, so you can stay the whole day without having to go home for lunch. There is also a nearby park for visitors to enjoy. A beach sticker is required to park here, or visitors can pay the daily fee ($15/weekdays, $20/weekends and holidays). Veterans Beach, Hyannis. Located at 480 Ocean Street in Hyannis, Veterans Beach is a blast for the whole family. Aside from the beach, there is also a playground, an area to barbeque, and volleyball. There is a park adjacent to the beach which houses the John F. Kennedy Memorial and the Korean War Memorial. The park has shady pine trees and benches, so this can be a nice place to spend a lazy summer’s day.The beach is a great place to gather shells and watch boats. There are lifeguards on duty during the summer, and there are restrooms and showers available. A sticker is needed to park. Loop Beach, Cotuit. Located off of Ocean View Avenue in Cotuit, Loop Beach is a beautiful beach, with calm water and a roped off swimming area. There is a lifeguard on duty up until mid-August and there are restrooms and showers. A sticker is required to park here. Sandy Neck Beach, Barnstable. This well-known beach is located off of Sandy Neck Road in West Barnstable and is quite popular. Off-road vehicles are allowed on this beach, but you do need a permit. Campfires are allowed on the beach after 7pm or sunset (whichever comes first). Horseback riding is also allowed on the beach. There are lifeguards on duty during the summer. There are restrooms and showers here. A permit is required to park. Kalmus Beach in Hyannis is one of the Town of Barnstable's many must visit spots. Photo by William DeSousa-Mauk.